The Convergent Lady Beetle (Hippodamia convergens) is the most common lady beetle (or ladybug) in the US. These beetles have red to orange elytra (hardened forewings) with up to 13 black spots (6 on each forewing and one spot between the forewings). The number of spots is variable and some Convergent Lady Beetles have no spots. A Convergent Lady Beetle is identified by the two converging white lines on its black thorax. These white lines don't quite touch, but they would form a "V" shape if they did. I found this one along with large numbers of others on Mt. Bigelow in October. Convergent Lady Beetles are highly beneficial insects as both the adults and larvae are voracious predators of aphids, whiteflies, and other small plant pests. The six-legged larvae look a bit like tiny orange and black alligators. When autumn arrives, hundreds of adult Convergent Lady Beetles will congregate together in sheltered spots to spend the winter in a state of semi-hibernation. They will sometimes try to seek shelter in unexpected places, and occasionally people will find hundreds of them inside their houses. In California, these beetles will migrate up to the cooler, moister Sierra Nevada Mountains in the fall. Once in these mountains, the Convergent Lady Beetles will form huge aggregations of thousands of beetles in protected spots. 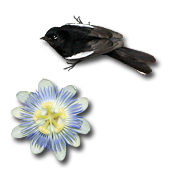 Once spring arrives, they will migrate back to the warmer lowlands. Large numbers of Convergent Lady Beetles are collected in the wild from their aggregations in the Sierra Nevada Mountains and put into refrigerated storage before being packaged and distributed as a form of natural pest control for the garden. Small buckets of live Convergent Lady Beetles are commonly found for sale in plant nurseries. 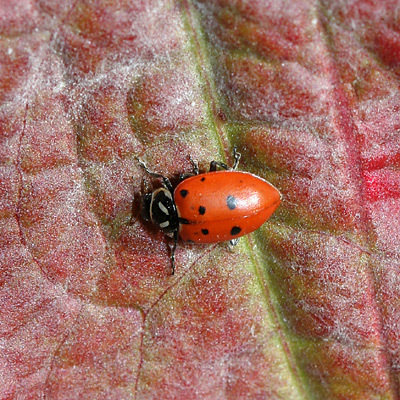 While these wild-collected Convergent Lady Beetles can be very effective for natural pest control in sealed greenhouses, they may not act like normal, local Convergent Lady Beetles, and may instead refuse to eat as if it was still winter or quickly disperse as if they still needed to migrate. I don't know if there are any farm-raised Convergent Lady Beetles available, but they would probably be a better (and more environmentally-friendly) choice. Convergent Lady Beetles can be encouraged to visit the garden by limiting the use of wide-spectrum pesticides. Since these beetles are rather tame, they can be captured locally and brought back to the garden, where unlike the California-collected ones, they may be more likely to remain and feast on aphids and other pests.